It was another record day for small caps and tech stocks as the Russell 2000 was up 0.68% and the Nasdaq was up 0.67% on Wednesday. The S&P 500 was up 0.86% to 2,772. The next big technical milestone is 2,787 which is the 2nd highest peak in history. It was the first failed attempt at a new record high after the January peak. I’m still bullish on stocks, but obviously less so the more the market goes up. The CNN Fear and Greed Index is now at 65 out of 100 which signals greed. If the market goes straight to the all-time high, it will be extremely overbought like the Nasdaq and Russell 2000 already are now. The two down sectors I’ve highlighted in the past which could help the S&P 500 if they were revived were the financials and consumer staples. The consumer staples underperformed on Wednesday as they were only up 0.14%. However, the financials did well as they were the 2nd best performing sector on the day, rallying 1.84%. The yield curve hasn’t flattened much in the past couple of days as the trend where stocks rally and the curve flattens has ended. The latest difference between the 10 year and 2 year yield is 45 basis points. Next week is the Fed’s meeting. The 25 basis point rate hike is completely priced in as there’s a 93.8% chance the Fed raises rates. The Italian crisis temporarily put the possibility of 2 rate hikes this year on the table. That option has now been taken away as the two strong possibilities are either 3 or 4 hikes. If the curve stays where it is, the Fed will be lucky. I’m working under the assumption that the Fed stops its hikes when the curve inverts. The Fed is concerned about an inversion, but clearly not enough to slow down hikes. Even though stocks rallied on Wednesday, the main discussion on Wall Street was driven by a Goldman Sachs call for GDP growth to peak this quarter. The Goldman Sachs GDP tracker is showing 3.7% growth in Q2. That’s the same as the CNBC GDP tracker which averages 10 forecasts. Given the structural slowing in all advanced economies, I think if GDP growth does come in at 3.7%, it will be tough to accelerate higher. However, I don’t necessarily think slightly lower growth throughout 2018 means stocks will necessarily fall. There could be a modest rebound in Europe, especially since the Italian political crisis has calmed down. Better weather could help Europe since each basis point of growth is highlighted so much because nominal growth is so low. For America, the trajectory of the economy will be interesting because spending on gas and utilities could come down because of lower fuel costs. However, the consumer will regain more spending power. Spending on fuel likely came down in May even though oil was still high then because this was the hottest May on record. That is in stark contrast to April which was the coldest in 2 decades. The question remains if American growth is being pushed higher by the tax cuts. If so, there will be more growth momentum than just one great quarter of results. If international markets turnaround, American GDP growth could improve after Q2, in theory. The factory orders report showed a 0.8% decline month over month which missed estimates for -0.4%. The underlying numbers were much stronger than the headline number because it was manipulated lower by the volatile aircraft sales. If this volatile segment of the economy rebounds, economic growth could be higher. I’m making this point to explain parts of the economy which can improve. 3.7% GDP growth would be high, but it’s far from a perfect quarter. The report is in two segments. The nondurable orders were up 0.1%, with petroleum and coal growing quickly. The durable goods orders were down 1.6% which is one tenth of a percent lower than shown in the durable goods report last week. Civilian aircraft sales were down 28.9% after being up 60.8% and 14.5% in the last two months. Orders for core capital goods were up 1% which is one tenth better than last week’s advanced report. The services sector has been the weaker one in the past couple months as the goods producing sector has been accelerating. 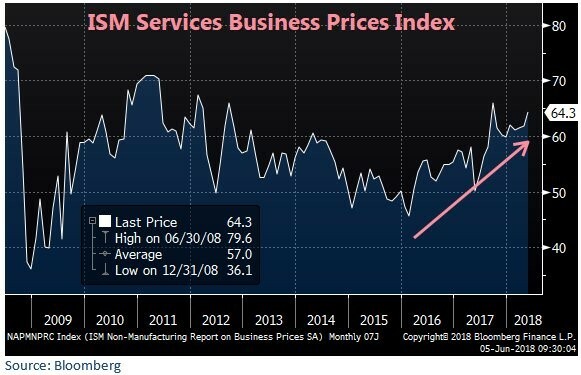 The ISM non-manufacturing report indicates that May was strong for the services sector, potentially matching the strength in manufacturing. The composite was 58.6 which beat the consensus for 58.0 and the prior month’s report of 56.8. The manufacturing PMI was exactly at the 12 month average while the NMI was 0.9 higher than the average. It’s only 1.3 away from the 12 month high which was set in January. The new orders index was up 0.5 to 60.5. It’s the highest since February when it was 64.8. As you can see from the chart below, the price index increased 2.5 points to 64.3. It is nearing the highest level since 2011. This indicates the May CPI report, which comes out next Tuesday, might run hotter than April. This NMI is consistent with 3.5% GDP growth. Unlike the reports from Q1, this one is close to accurate as the hard data from April implies Q2 growth will be strong. Let’s look at a quote taken from a professional, scientific, and technical services company. The management team stated, “Oil price stabilization in the (US) $60 to $70 per barrel [is] having a positive impact on hiring, both contract labor and direct employees, in the oil and gas industry and supporting industries.” Since this report is updated, we’re starting to see results from the recent decline in oil. It means costs have moderated at least temporarily. Oil should be stable until the June 22nd OPEC meeting or until rumors about what will happen get leaked.